Well, they were right about the second thing. My parents had an “audio system” similar to this one. I’m pretty sure dad bought it at JCPenney, or “the Penney store” as he used to say. I’m not so sure if it was the catalyst for mom hooking up with dad. Oops. Shouldn’t have imagined that. Looks like he got the stereo and the girl. Note: I couldn’t bring myself to buy the magazine I found this in (the seller was very optimistic with the price), so I had to make do with a photo instead of a scan. Deal with it. …from a name you’ll never remember. We call it the Meriton HF-2105. You’ll call it terrific. Because the sound of the HF-2105 is really something to listen to. With its hefty power output (6 watts per channel min. RMS into 8 ohms from 60Hz to 12kHz with no more than 2% total harmonic distortion) the HF-2105 delivers a big sound that can fill a big room. There’s also a built-in cassette recorder. So you can listen to pre-recorded cassettes. Or make your own easily with one touch recording, automatic level controls, and automatic shut-off. We’ll also improve your record collection. With a deluxe BSR 3-speed automatic record changer. Complete with both magnetic cartridge and diamond stylus. If you like superb AM/FM or FM stereo, with the HF-2105 tuner’s section you’ll hear all the stations…beautifully. And you’ll hear all this music the way it should be heard. Because the HF-2015 comes with 2 two-way tuned port speaker systems. Each with a 2 1/4” tweeter and 8” woofer. 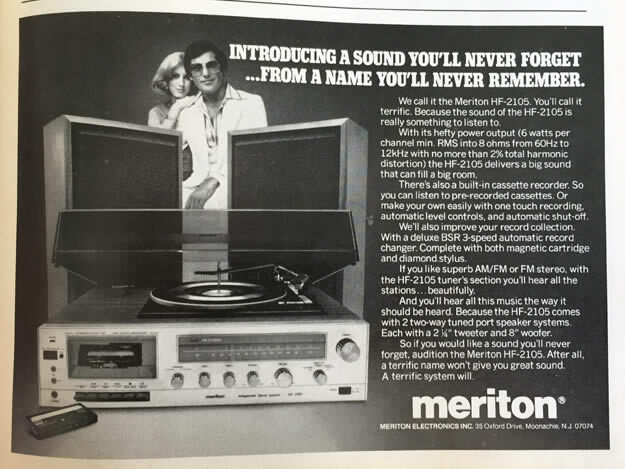 So if you would like a sound you’ll never forget, audition the Meriton HF-2105. After all, a terrific name won’t give you great sound. 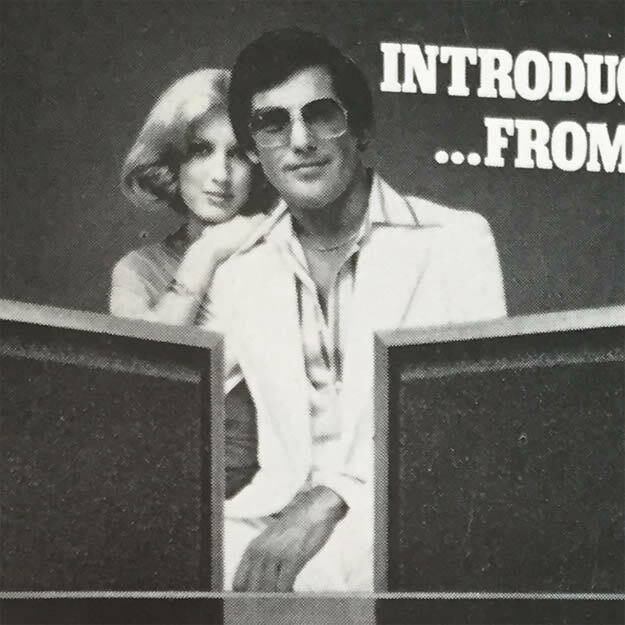 This entry was posted in ads of yore and tagged 1970s, 70s, ads, advertisements, advertising, audio, audio equipment, audio systems, magazine ads, print ads, seventies, stereo, stereos, vintage, vintage ads on January 21, 2017 by Clayton Hove.